If you are planning a trip to Marrakech, Morocco, you absolutely MUST book a stay in a riad! 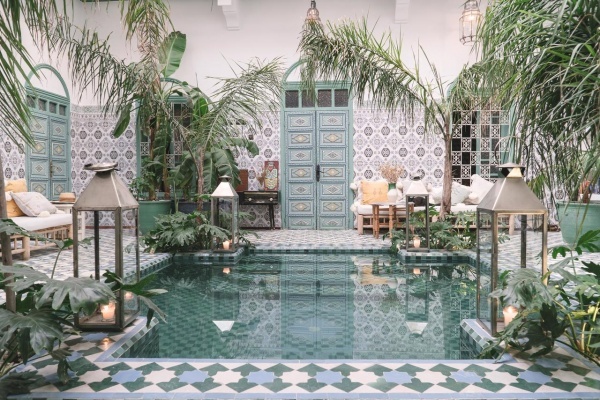 Riads are a traditional style of Moroccan house that has a central interior garden or courtyard, usually with a fountain or pool at the center. You’ll fall in love with the amazing architecture of each riad and will feel like a queen while enjoying hot mint tea on the terrace. It’s an absolute must-do while visiting Marrakech so check out our top 7 favorites that are all amazing choices for your upcoming trip! Riad Kasbah is a gorgeously decorated riad located in the heart of the medina. A large pool dominates the center of the lower floor while a beautiful rooftop patio offers spectacular views of the city. Tall archways, intricate woodwork, and traditional decor give the Riad Kasbah it’s charm. Rooms are spacious with simple and clean decor. The bathrooms in each room are especially impressive with beautiful stone and tilework. They are updated while remaining true to their traditional roots. You’ll love dining on the delicious home-cooked, complementary breakfast on the terrace with views of the Atlas Mountains. And you can relax knowing that you’ll have reliable wifi access and air conditioning to cool you down after a long day exploring the hot medina. The Hotel & Spa Riad El Walaa is such a peaceful oasis in the middle of the hectic medina, you may never want to leave! The indoor pool is absolutely stunning and there are plenty of comfortable chairs around it for lounging in the sun. There are lovely seating areas located throughout the riad – perfect for spending a few hours with a good book and a cup of hot mint tea. Plus you’ll love having an onsite hammam to relax and unwind. Each room has wifi, air conditioning, and a patio. Beds are large, plush, and unbelievably comfortable. It will be your home away from home! Every room at the Dar Kandi Riad is immaculately outfitted with traditional Moroccan decor. They are huge, lavish, and so ornate. Much thought has gone into making this riad unique while keeping the traditional charm. But the real selling point of the Dar Kandi Riad is the gorgeous rooftop terrace. Comfortable lounge beds surround the beautiful outdoor pool. It’s the perfect place to spend an afternoon in the sunshine. The location is a bit further outside of the medina, about 1.3 kilometers from the square. You’ll enjoy being in a more upscale neighborhood, outside of the hustle and bustle of the old city. If you’re looking for a riad with a ton of character, the Riad Goloboy is where you want to be! 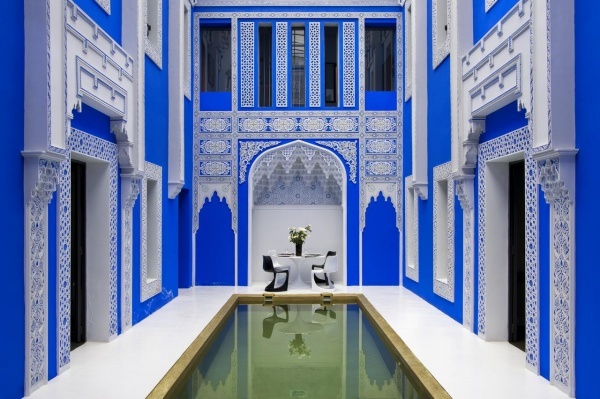 The bright blue walls are highlighted by bright white, intricate latticework. All surrounding the beautiful indoor heated pool in the center. It’s the perfect place to stay if you are looking for the perfect Instagram shot! The staff here are incredibly personable and helpful. 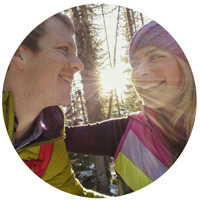 They can help you to arrange any tours or activities around Marrakech. Each room also has fun and vibrant decor. You can enjoy the rooftop patio on sunny days. Wifi access is also available throughout the riad. Riad BE is probably the most well-known riad in all of Marrakech due to its popularity on Instagram. And the central courtyard is quite spectacular. Turquoise tile and decor mix with tropical plants to create a gorgeous oasis that you can’t help but photograph! The rooftop at the Riad BE is also incredibly beautiful with plenty of hammocks and sun beds for lounging. It even has a shisha corner where you can partake in the popular activity. Located down an alleyway outside of the main square, you’ll appreciate being in a quieter neighborhood. It’s a bit difficult to find so be prepared with a downloaded google map. Riad Melhoun & Spa is centrally located in Marrakech, just a short walk from El Bahia Palace. 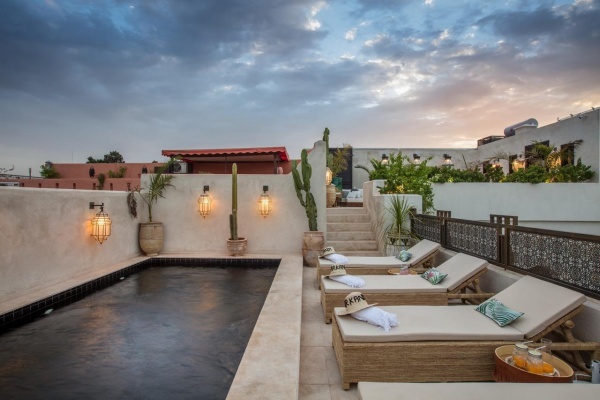 You’ll be spoiled at this gorgeous riad that features a pool in the central courtyard, surrounded by immaculate traditional decor. Guests of the Riad Melhoun will love the quaint areas for lounging. There is a rooftop terrace with views of the medina, a living room with a cozy fireplace, and a third lounge area with books available to borrow during your stay. Rooms are also large and beautifully decorated if you’d rather have some privacy. The onsite hammam is a wonderful perk of staying here. For an additional cost you can enjoy the lavish spa services. A breakfast buffet is served every morning on the terrace where you’ll be surrounded by lush greenery. It’s the perfect place to get some peace and quiet in Marrakech! You can tell that so much consideration has gone into every nook and cranny at the spectacularly lavish Riad Jemaa El Fna & Spa! 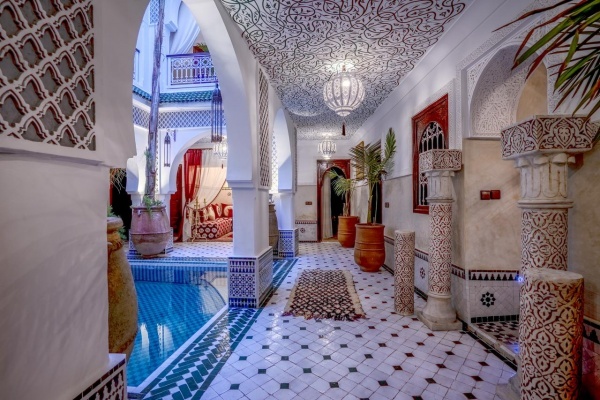 You’ll be treated like absolute royalty at this perfectly picturesque riad. You’ll love relaxing in the pristine indoor pool in their central courtyard or upstairs on the sunny terrace. From the friendly staff to the unique decor, this riad has done everything to ensure that your stay in Marrakech is unforgettable. Every room has a patio and is outfitted with every amenity. You can indulge in the hammam spa services if you please. And a delicious breakfast is served every morning to get your day started off right. Want more inspiration for what to do and see in Morocco? Check out our favorite travel books! On my second trip to Morocco I think I’ll have to try a riad! !